Graeme Croft refers to the slump in share price of aged care companies (Letters, 6/9). This followed analysts downgrading aged care stocks after the government issued new guidelines. After the budget announced changes to the Aged Care Funding Instrument, causing providers concern about profits, some privately owned aged care homes responded by charging additional service fees, including “capital refurbishment fees” and “asset replacement contributions”. These fees improved profits but did not provide any benefit to residents. The Department of Health has announced that these types of fees contravened the legislation. So while I agree with Croft that the industry needs serious reform I don’t agree with his conclusion. The care of vulnerable older people is too important to be left to the free market. In an unregulated environment, these extra charges, up to $18 a day, would have gone unnoticed. Croft also refers to the “high standards” set by the government. On the contrary, legislation falls remarkably short of demanding high standards. Unlike childcare centres, there is no requirement for aged care homes to have mandated staff-to-resident ratios. The accreditation and outcome standards also remain woefully inadequate. “Consumers” of aged care are often frail. They do not have the capacity to “drive” the residential aged care sector. Reverse the aged care cuts? Residential aged care in Australia is big business. The Aged Care Financing Authority estimates the residential aged care sector requires $31 billion of investment over the next decade. To attract investors, the Productivity Commission recommends a competitive market with reduced regulation. Private equity firms, new foreign investors, and superannuation and property real estate investment trusts are entering the residential aged care market in large numbers. The ‘Living longer living better’ aged care reforms have decreased regulation and introduced a consumer-driven market based system. The irony of this move towards a free market system is that providers rely on government subsidies. The government pays approved providers a ‘residential care subsidy’ for each resident living in an aged care home. The amount for each resident is calculated using the Aged Care Funding Instrument (ACFI). ACFI is used to pay subsidies based on each resident’s level of need. It has three funding categories: Activities of Daily Living, Behaviour and Complex Health Care. Funding in each of these domains is provided at four levels: high, medium, low or zero. ACFI provides a financial incentive to classify residents as requiring a higher level of care. The provider receives additional subsidies when a resident is reclassified as requiring a higher level of care. However, staff levels rarely change nor are extra services provided to the resident. Where do our taxes go? Under the current arrangements, the providers do their own assessments for government subsidies. Although politicians and peak bodies may claim that the overwhelming majority of providers are doing the right thing, the ACFI Monthly monitoring reports do not support this claim. It has been reported that one-in-eight of 20,000 ACFI claims audited last year (2014-15) were deemed to be incorrect. This figure is already tracking higher at one-in-seven in 2015-16. The ACFI Expenditure Working Group has been formed to understand the causes of recent growth in residential aged care subsidies. Michael Pascoe asked: “Where’s the dividing line between systemic fraud and “innocent mistakes” in the aged care sector? It’s somewhere in the hundreds of millions of dollars very-much-for-profit aged care providers have been ripping out of the system by exploiting a flawed funding model – a model that encourages exaggerating care needs and discourages improving the health and independence of individuals”. The changes to the Aged Care Funding Instrument (ACFI) announced in the federal budget have caused some private providers to worry about their profits. In a letter to managers of aged care homes, Optimum Healthcare Australia estimates the changes to ACFI will result in an average 80-bed aged care home losing $439,000 per year in government subsidies. Not surprisingly, the peak body representing private providers is asking the government to reverse its decision. Leading Aged Services Australia has launched a campaign: ‘Reverse the Cuts – Fund the Care Australian Seniors Need and Deserve’. In response, Aged Care Matters has begun a reverse campaign: “Cut the greed: Provide the care Australians fund”. When a resident is classified as requiring higher needs, additional resources should be directed towards the resident with higher needs. Aged Care Matters also calls on all providers to stop exaggerating residents’ care needs. Optimum Healthcare Australia recommends aged care homes re-appraise residents before the January 2017 to ensure funding is “grandfathered”. They recommend residents’ care needs are reassessed “to determine what care they actually need, not just what is reported by carers.” With their assistance, providers will “experience minimal financial impact from the [ACFI] changes”. Some ACFI coordinators and ACFI consultants describe their role as “generating income for the providers”. An ACFI coordinator for an aged care home with 160 beds told Aged Care Matters that he is “highly stressed as the provider expects the ACFI rate for all residents to be at least $204 per day”. He described the provider for whom he works as “cooking the books” to maximise funding. ACFI consultants must not only stop exaggerating residents’ care needs, they must also stop reclassifying residents with an illness and care needs that they do not have. Recently, an aged care home falsely claimed a resident had Parkinson’s Disease, and related health deficits, for which the provider claimed a subsidy under ACFI. When his daughter complained to ACFI Compliance Section, she was told that the appraisers “must be able to trust the word of the health care professionals at the aged care facility”. ACFI is built on an honesty system. In an era of fraudulent behaviour in both pink batts and private colleges, it is clear that profit-based systems that rely on government subsidies cannot rely on honesty. The funding of aged care homes require transparency, scrutiny and accountability. We must all know how the providers spend our taxes. When a resident in an aged care home is reclassified as requiring a higher level of care, the extra funding should be used to employ more staff or to introduce services such as strength training, music or lifestyle programs that would improve residents’ quality of life. Their care must not be traded on the market like any other commodity. Dr Sarah Russell is the Principal Researcher at Research Matters and a former Registered Nurse. She is a foundation member of Aged Care Matters. 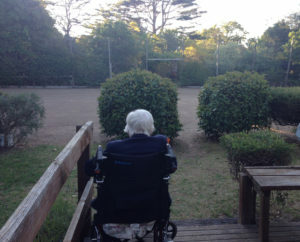 Author Sarah RussellPosted on July 5, 2016 October 17, 2016 Categories Aged Care Funding, Aged Care Funding InstrumentLeave a comment on Reverse the aged care cuts? Religious, community-based and charitable organisations were once the main providers of residential aged care in Australia. Families could feel reasonably secure that while standards of care would vary, aged care facilities were not motivated by profit. During the past decade, privately owned aged care facilities have grown at twice the rate of those in the non-profit sector. Publicly listed companies are now the fastest growing owners of aged care facilities. Earlier this year, Bentleys Chartered Accountants reported that profits in the aged care industry rose significantly. Despite the small sample (only 179 aged care homes), their report estimated that net profits jumped 159% in 2015, from $4.14 to $10.71 per resident per day. The growth in the aged care industry is underpinned not only by our ageing population but also government subsidies. Major aged-care providers such as BUPA, Japara, Regius and Estia receive substantial government subsidies. Estia, for example, received a 10.9% increase in government subsidies during last financial year. The peak bodies that represent providers of residential aged care – Leading Aged Services Australia (LASA), Aged and Community Services Australia (ACSA) and Aged Care Guild – have described these changes as a “budget cut”. The Aged Care Guild complains that the budget is fuelling uncertainty in the industry and could force a rethink on future investment plans. In an increasingly competitive environment within the aged care sector, peak bodies for providers have successfully lobbied the government for less regulation. The recent Aged Care Roadmap describes “lighter deregulation” and a “consumer driven and market based system”. Paradoxically, the providers of aged care homes lobby simultaneously for a decrease in regulation and an increase in government subsidies. Currently, funding for aged care homes is based on a ‘terminal decline model’ rather than ‘restorative care’. The provider receives additional subsidies when a resident declines. There is no financial incentive for providers to introduce services such as strength training or lifestyle programs that would improve residents’ quality of life. Instead, a provider is rewarded for promoting dependency rather than encouraging wellness. Under the current arrangements, the providers do their own assessments for government subsidies. Many providers employ staff purely to complete the ACFI paperwork. The role of these staff is to generate income for the employers rather than provide care to residents. Some providers employ Aged Care Consultants who specialise in “ACFI optimization”. These Aged Care Consultants promote themselves as specialists who help to maximise funding for the aged care home. It is not only the for-profit organisations that are making massive profits in residential aged care. Mecwacare, for example, is as a not-for-profit organisation that offers residential aged care. According to its Annual Report, it made a net profit of $3.9M for the year ended 30 June 2015. It purchased a new head office and added a further six Aged Care Homes to its portfolio. The federal government recently introduced fines to curb a growing trend of incorrect, or deliberately false, claims for subsidies. Whether a fine of merely $10,800 for providers who repeatedly make false claims will act as a deterrent remains to be seen. Money may speak louder than the coroner. Coronial inquests into separate deaths at two aged care homes, BUPA Kempsey and Arcare Hampstead in Melbourne, exposed inadequate care, mismanagement and cover-ups in response to complaints. Despite this inadequate care, both BUPA Kempsey and Arcare Hampstead were fully accredited by the regulator, the Aged Care Quality Agency, with perfect scores of 100 per cent in all criteria. Surely this suggests something is wrong with the accreditation processes. Following the coronial inquiries, both homes were asked to improve their policies and procedures. However, the Aged Care Quality Agency did not change the accreditation processes. The accreditation and outcome standards remain woefully inadequate. The Australian Aged Care Quality Agency must review the process of accreditation. The accreditation process should play an important role in monitoring the standards of care in all aged care facilities. Given accreditation enables aged care facilities to receive government subsidies, it should not be a rubber stamp. Dr Sarah Russell is the Principal Researcher at Research Matters and a former Registered Nurse.